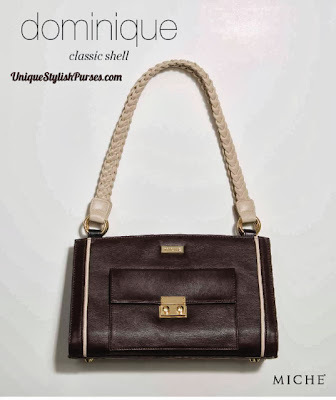 Dominique Miche Shell for Classic Bags features timeless styling and go-anywhere colors. This chic Classic Shell glams up any outfit and brings out your inner fashionista. Rich espresso-brown faux leather is offset by creamy piping detail on the front and back as well as gold hardware. Front flat pocket with squeeze-lock closure completes the look.